Ask about her preference when it comes to batting and backing. As does layered applique, the choice of batting and backing can have an effect on the quality and stitch size of hand quilting. One of the first quilts I was hired to hand quilt had flannel backing and thick cotton batting. It was a king size Double Irish Chain with velvet for the diagonal squares throughout. A beautiful quilt, no question about it, but I came to think of it as the Quilt from Hell ... it was too thick to get a very small stitch, plus it was so bloody heavy I had a hard time manipulating it as I hand quilted. Also, I have many allergies ... if you have down or wool anywhere in the quilt at all, I'm out. I generally charge from .08 to .10 per square inch of the measured quilt. 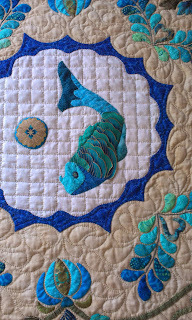 This will depend on the amount of quilting to be done, the design quilted, the difficulty of the quilting (if you show up with a batik quilt, be prepared to pay more) and if you are a repeat customer you may get a discount.